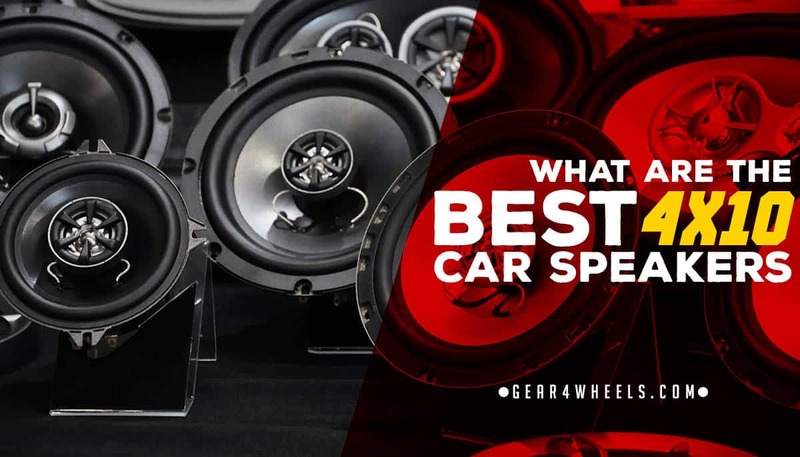 What are the best 4x10 car speakers? Are you in search of high volume, or does quality sound matter more? If you can find speakers that offer both of these qualities, you know you’ve hit the jackpot. A variety of features play a role in producing loud, clear sound. Firstly, the speaker has to handle enough power and translate it into clear sound over all frequencies. I have compiled a list of the best 4x10 speakers that offer both volume and excellent sound. You can use the list below, in which I put together the most important features of each speaker. This list is a byproduct of some massive research we conducted on car door speakers earlier this year. You can read the main article here. Now, you can choose the ones you know will meet your requirements, so enjoy! I loved the Kicker KS Series since the first time I had the chance to test it. These speakers are only 11.5”x11.5”, but the quality of the sound they produce makes for excellent auditory enjoyment. Thanks to a tweeter and woofer driver, you can enjoy all ranges of music. The drivers are paired with a quality motor structure. This means your pair of Kicker speakers will not only give clear sound, but you can push the volume without fear of too much distortion. The manufacturers made sure that everyone can enjoy the speakers, because this Kicker upgrade is compatible with almost any vehicle. They even offer a full 2-year warranty, which is almost unheard of when it comes to speakers. That’s proof that these speakers are of a high quality and standard. You may expect these speakers to come at a high price, but they’re actually quite affordable. This means you receive a combination of the right quality and price in one deal. Pioneer is known for its range of exceptional technological devices. If you want to stick to one brand for audio and visual equipment in your car, Pioneer may be the answer to your needs. ​Here's a review of some of the most popular speakers from Pioneer, as well as an overview at their current lines of product. You will find all components you need at Pioneer, and sticking to one brand lowers the chance of parts not being compatible. These speakers are one of Pioneer’s products that I know will put a smile on your face. Thanks to not one, but three tweeters built into the speaker, even high frequencies are heard crystal clear. If you love low bass sounds, the woofer will easily provide it. Though they’re not the most powerful speakers on the market, they will provide loud volumes. The sound is further enhanced by strontium magnets and urethane surrounds. The Injection Molded Polypropylene cone serves to secure the unit and assists in promoting mid-bass response. The casing protects the contents through cloth that’s also coated in foam rubber. Exceptional quality comes at a high price sometimes. In this case, be prepared to pay a little extra for the quality you receive. I see Cerwin-Vega went to a lot of effort to offer clients a well-designed speaker and casing. I also ﻿﻿reviewed Cerwin Vega's most popular speakers﻿﻿ on this article after testing over 30 models from the brand. The design not only influences the type of sound you get from the speakers, but also their durability; after all, you don’t want your speaker to deteriorate in its functioning after only a short time span. This exceptional quality is available at a very affordable price. While the sound quality is only average, some customers may prefer to focus on durability rather than high volume. Quality of sound lacks on low frequencies. The Powerbass S-series speakers have been around for quite a few years. Each new item carries the exceptional features of its predecessors, while PowerBass keeps on adding more amazing characteristics. With the S-4102 model, Powerbass improved aspects of the tweeters for even better high-frequency sounds. These sounds are further enhanced by using pure silk on the dome tweeters, similar to what is usually used in home theater systems, which is known for the excellent sound it produces. Apart from high sounds, you’ll love the quality of the mid- and bass-ranges, thanks to the Digital Directivity Control (DDC) of the cone. The size of these units is only 4”x10”2.4” and astoundingly, it only weighs 1 lb. The size makes it easy to fit into most vehicles, and the weight means your car sound system won’t negatively impact your driving experience. Powerbass puts a lot of effort into creating optimum sound, but this may not be the most durable speaker on the market. If you’re planning to use it at maximum power for extensive periods, you may notice distortion later on. Planet Audio makes sure it offers a solution to a variety of clients’ challenges. This is apparent in the many size speakers they offer. These 4x10 speakers are ideal for use in most vehicles and you can pair them with other Planet Audio items for the optimum sound experience in your vehicle. Planet Audio offers you speakers which offers quality sound, and all of it is available at a reasonable price. If you want to know whether this will fit in your available space, you need to make room for an 11” x 4.8” x 3” speaker. They each weigh in at 2 lbs., which makes them easy to handle if you’re planning a DIY project. It also means your car won’t feel much heavier after installing additional components. The speaker doesn’t offer exceptional bass sounds and unfortunately, it’s not a very durable speaker. If you pump high volume sound through it, you’ll quickly hear distortion and it may even completely blow. You can hook them up to subwoofers to assist, but this beats the purpose of installing 4x10 speakers, especially if you have limited available space. So, which should you choose after all of that? I would suggest you give the ﻿﻿﻿﻿Kicker KS410 a try. These speakers rate high in both aesthetics and functionality. Their durability is proven by the extensive available warranty. If you’re looking for a long-term answer for stunning sound in your vehicle, Kicker may be the brand you’ve been looking for. Thanks for the review! I think I’ll be picking the Cerwin Vegas for durability purposes.